A patron browses Shari Grenzow Mauer’s booth at the fifth annual Dunwoody Art Fest. Photo by Lauren Ramsdell. It has been a year of fifths for Dunwoody, one of DeKalb’s newest cities. The fifth annual Dunwoody Art Festival ran May 10-11 during a weekend of intermittent drizzle and low-level clouds. 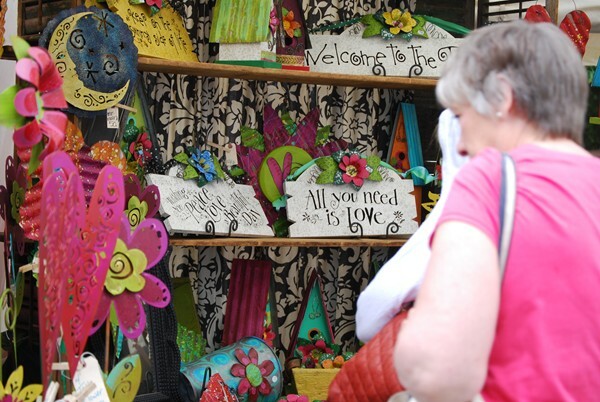 The festival, always hosted on Mother’s Day weekend, was nonetheless a celebration of all things quirky and colorful. Schube started the festival in Dunwoody after the first city manager, Warren Hutmacher, transferred his leadership from Norcoss. Schube had been hosting the Norcross Art Fest since 2003 and was asked to start a new festival in Dunwoody. Artists are selected from all over the country, including many local artisans. One artist, Shari Grenzow Mauer, made the 13-hour, 870-mile drive from Kiel, Wisc. Mauer has been doing art and craft fairs for more than 20 years. Schube found and invited Mauer first in 2012, and although she was unable to return last year, this year she made the trip. Despite the gray skies, the festival attracted hundreds, according to Schube. Mauer said this year sales had also been good. “[On] Saturday, the husbands and fathers are shopping for the wives and mothers, and [on] Sunday, the wives and mothers are shopping for themselves,” Schube said. The next Splash Festivals event is the 11th Annual Norcross Art Fest the weekend of Oct. 10 and 11.